Freddy's Dead: The Final Nightmare (also known as A Nightmare on Elm Street 6: Freddy's Dead) is a 1991 3D American comedy-horror slasher film and the sixth film in the Nightmare on Elm Street series. 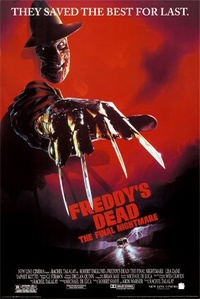 As the title suggests, it was intended to be the last film in the series; however, the success of the film prevented the series from ending (much like Friday the 13th parts four and nine). It is the sequel to A Nightmare on Elm Street 5: The Dream Child and is followed by Wes Craven's New Nightmare, which takes place outside the series' canon. This was New Line Cinema's first film released in 3-D. Upon its release, the movie received a worst critical reception from both film critics and series' fans. Robert Englund reprises his role as Freddy Krueger; Lisa Zane, Yaphet Kotto, Breckin Meyer, Shon Greenblatt, Ricky Dean Logan, Lezlie Deane and Tobe Sexton also star. Additionally, several well-known actors make cameo appearances in the film, including Johnny Depp (whose screen debut was in the original A Nightmare on Elm Street), Roseanne Barr, Tom Arnold, and Alice Cooper. Iggy Pop sings the movie's title song, which plays over a montage of scenes from the previous Nightmare movies during the end credits. This webpage uses material from the Wikipedia article "Freddy%27s_Dead%3A_The_Final_Nightmare" and is licensed under the GNU Free Documentation License. Reality TV World is not responsible for any errors or omissions the Wikipedia article may contain.